Heather from mamaiscomic.com gave SFG permission to publish this fabulously hilarious comic on breastfeeding. 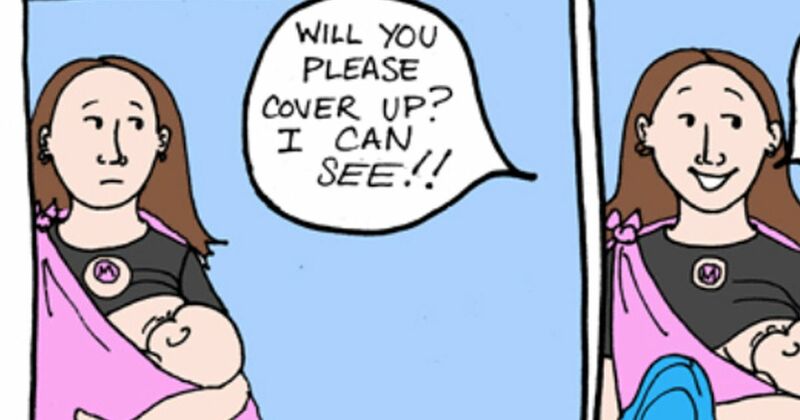 Breastfeeding in public is definitely controversial, and this artist illustrates the two sides quite cleverly in the comic below. On one hand, those against breastfeeding in public will frequently request new mothers to cover up. According to Time, in July 2014 an Ottawa woman complained to a Starbucks barista that another mother was showing off too much while feeding her baby. In another instance, on public forums on debate.org someone went as far as saying breastfeeding in public was "disgusting." Supporters of breastfeeding in public quite often are disturbed by the naysayers, citing that feeding the baby naturally is better than from a bottle. Annie Reneau told Scary Mommy blog, "Covering up implies that there’s something inappropriate about feeding a baby. There’s not. It's feeding a baby. That's it." Another public commenter from debate.org adds, "As a mother, you have the right to feed your child whenever or wherever the need arises, and not have people stare at you like you're doing something wrong or disgusting." What are your thoughts on breastfeeding in public? Let us know in the comments below.